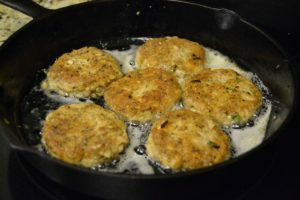 Salmon Patties: because sometimes you don’t live in a town that gets fresh seafood delivered daily…. Or you’re looking to add more omega-threes to your diet… Or you need a more affordable option for supper…. Or it is a comfort food from childhood… Or it’s all you have in your pantry…. Or you are dead-set on implementing more meatless-meals into your family’s menu…. or just because. 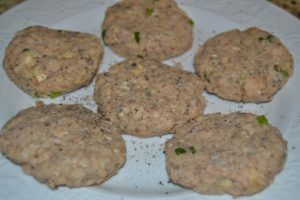 I know all the reasons one would want salmon patties because they were a regular meal in my home. My grandmother, Nan, lived with us (yes, three generations of women and a poodle were under one roof all at once–my poor dad! 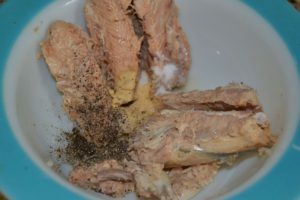 ), and she always felt the need to justify salmon’s frequent occurrence on the table. This wasn’t because any of us were opposed to the patties, per se, but she took “cooks don’t clean” to new levels. That’s normally a fair rule; but, as good of a cook as Nan was, she was equally as messy. She was very unconservative on dish and utensil use, and she seemingly believed the more grease splatter=the better. Whatever the reason, these are delicious and very budget-friendly, and that’s what is required in pure Appalachian cooking. 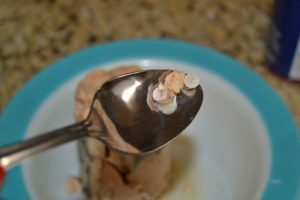 After watching Nan for years, I’ve been able to memorize and perfect her recipe to suit my own family’s taste buds… and cut down on the mess. 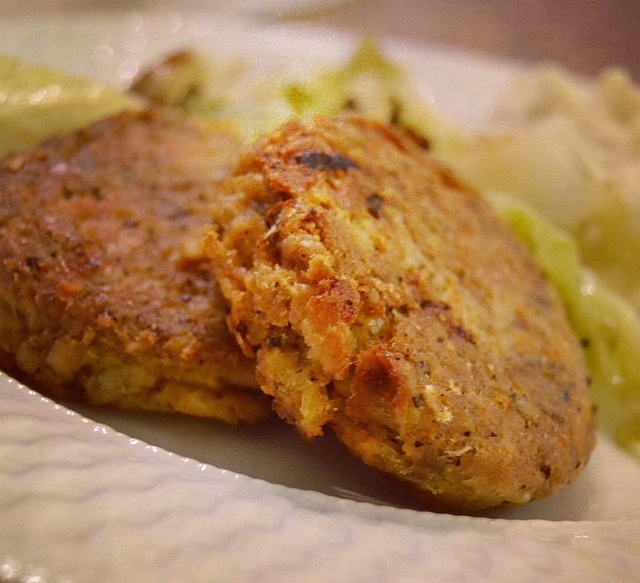 Enjoy these salmon patties tonight (or “salmon croquettes” if you are the fancy-type)! May I start with a warning: raw fish pictures are very rarely attractive. This rule of thumb is amplified when the fish comes from a can. On that note, pull out your can openers! I always mix salmon in this bowl. Nan did, therefore I do. 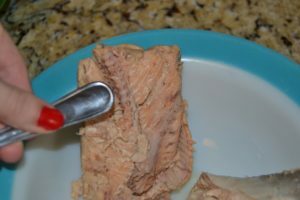 Open salmon and drain into sink. Put it in a fairly deep bowl and retain can for bones. Excavate the bones. Here’s a close up of what they look like. The bones should be right in the middle in a line (marked by the spoon). Don’t fret if you happen to miss one or two. 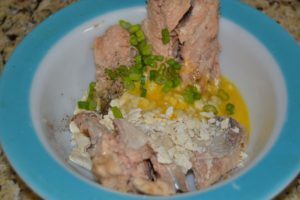 These bones are extra soft and with good mixing, they may be mashed right up and no one the wiser. 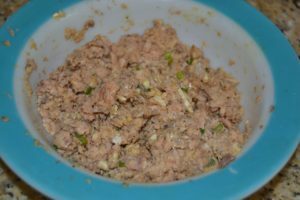 Add crumbled crackers, egg, and green onions. Pour oil into skillet to begin heating up. 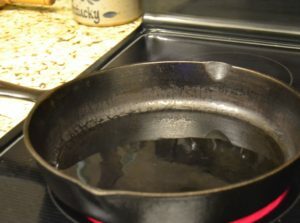 The oil needs to be about 1/4″ to 1/2″ deep in the skillet. Use an ice cream scoop for even-sized patties. This scoop is pretty serious… but we are pretty serious about our ice cream. Form patties. Keep the width even throughout the patties to prevent the edges from browning too quickly. 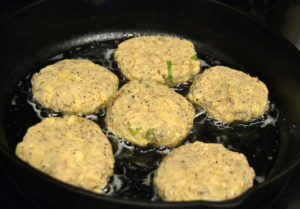 Place patties into hot skillet. Oil should not be smoking… turn down the heat if it is. Cook until golden brown, flipping when 1/2 way done (about 5-7 min). Let cooked patties drain onto a paper towel to collect any extra grease before serving. 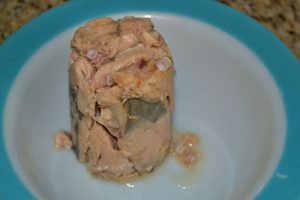 Open and drain can of salmon. Remove bones. Add all ingredients, mix. 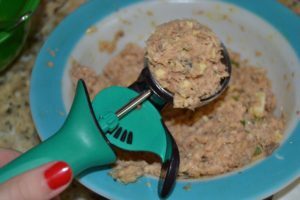 Scoop even portions and make into approximately 6 patties, ¾-1” thick. Fry in hot skillet in oil (canola or vegetable) until golden brown. Allow patties to set and drain on a plate for a few minutes with a paper-towel to collect any grease. Serve warm. Enjoy!